I've now completed a set of tank coils for the new'29 MOPA project. These were wound with 3/16" copper tubing which has become very difficult to source. Luckily, after much searching, I was fortunate enough to find several rolls locally at a very attractive price. Although I do see it quite often on e-bay, sellers either refuse to ship to Canada or their shipping charges are far too high to make it worthwhile. The larger 1/4" rolls are still readily available, but for any given inductance, will take up a lot more room on the breadboard if space is an issue. These coils cover the amplifier tank, the Hartley oscillator's tank, and the antenna coupling link. Respectively, the coils measure 4.9uH, 4.0uH and 1.9uH. Winding these is always fun but the method used requires that the needed length be predetermined and cut from the roll beforehand. The first time I did this, when building my TNT transmitter, I learned the hard way to always add at least another foot to cover the additional length eaten-up by turn-spacing and for coil end flattening and mounting. While visiting Vancouver for a few days I was able to find a couple of pieces needed for my non-line of sight (NLOS) lightwave experiments. 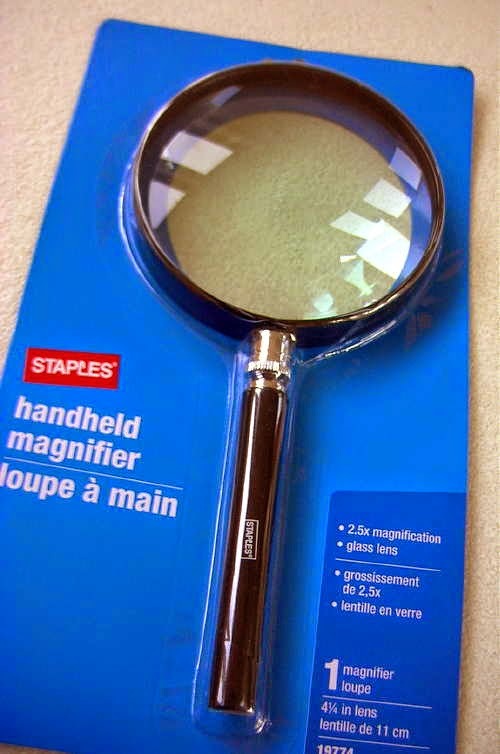 I purchased a nice 4.25" magnifier lens, with suitable focal length, as well as an inexpensive page-size fresnel magnifying lens. What is particularly pleasing is that the fresnel is a rigid lens, about 2 mm thick, unlike most page magnifiers that are thin and floppy. I have yet to test its blur circle or determine its focal length. I plan to use one or the other of these lenses in a small, portable lightwave receiver module that I can carry to the other side of the island to listen for the main large transmitter, aimed slightly above the horizon, in beacon-mode. If the smaller fresnel does the job, it will be an inexpensive source for anyone else needing a simple lens for either transmitting or receiving. 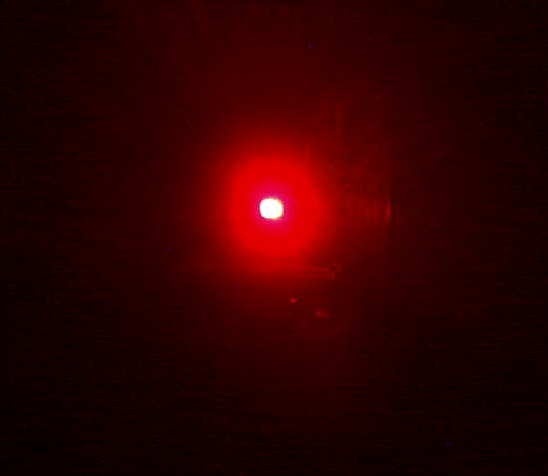 If the deep-red light tests prove successful, I'll switch the system to IR light but at this stage I'm not sure how focusing and optimizing receivers and transmitters can be done with a light source that is essentially invisible? Perhaps using an IR source that is right on the edge of deep-red will still have enough visible light to allow finding the optimum focus more easily. More information on NLOS experiments can be found in Yahoo's Optical DX Group as well is in G3XBM' s 481thz blogs. As well, anyone in the Vancouver lower mainland (as far as the northern Sunshine Coast area) that might be considering lightwave ... I'd love to work you! Pretty well any high spot in this region is direct LOS for me. 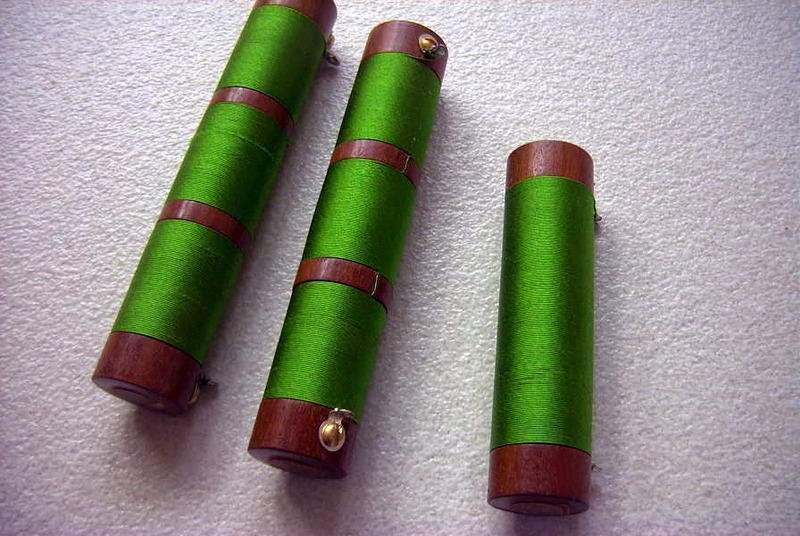 I have completed manufacture of the three RF chokes required for my new MOPA project. Two of the chokes (the ones in the amplifier) are broken into three sections, presumably to reduce stray capacitance or unwanted resonances while the choke for the Hartley oscillator section is one single winding. The choke forms were first turned on the wood lathe, using Mahogany hardwood scrap, to a diameter of 3/4", and then stepped down slightly, for the space occupied by the windings. The windings, using single silk enamel #31, were then done, still on the lathe, while rotating the spindle manually. I've always been surprised at how little inductance is really needed for effective choking on HF and it would seem that the 'standard' 2.5mH is much more than is actually required. The single-ended version is just 190uH, while the three-section chokes measure just 240uH, about 10% of what normally might be specified today. Listeners towards the central and southern portions of North America reported phenomenally good conditions this weekend, most unusual for a CLE event! Out west and here in BC, conditions were not noticeably enhanced and could best be described as kind of 'mushy' ... most signals were a struggle. The further south you went, the better the propagation became. Unfortunately, I am still struggling with noise pollution (cheap or failing CFLs) in a house about ten properties away, creating a constant 60 Hz hum and drifting birdies throughout the band ... as it was during the last CLE. Hopefully the owners of the home will return before the next CLE arrives! Listening for NDBs is a practical way to check out your LF receive capability, should you be interested in developing a good 630m station or in following the nuances of night-to-night MF propagation. Early morning (Jan 22) saw BCB conditions vastly improved over what they have been for most of the season. Because I am on the wrong (none-Pacific) side of Vancouver Island, as well as on the eastern shores of Mayne Island, I usually don't listen for Asian signals on my Perseus recordings but a quick check of Thursday's recordings revealed some very solid signals from many Japanese stations, as well as Korea. Most signals were strongest at around 1500Z (7 a.m. local) but were first audible from about 1200Z. Numerous other signals, reaching similar strengths were audible throughout the broadcast band on their 9KHz-spaced channels. Interestingly, I had configured my LF inverted-L into a temporary version of a low noise vertical (LNV) by removing all of the loading coil and feeding with an isolating impedance matching transformer. I rather suspect that in this mode it is acting as a normal quarter-wave inverted-L however as its self-resonant frequency, without any loading, is around 1200KHz. Today's conditions were much poorer but several Asian signals were heard once again. Should conditions improve, the next time I will use my large loop oriented to favor Japan and also take advantage of its ability to null many of the local blowtorch signals from Vancouver, off to the side. Once again it's time for the monthly Co-ordinted Listening Event (CLE) for NDB hunters....the 190th event. These always interesting and popular affairs take place over three nights, with this one starting on Friday, January 23rd, at local noon and running until Monday, January 26th, local noon. Our 190th Co-ordinated Listening Event is already less than a week away. from North America and maybe a few other places. 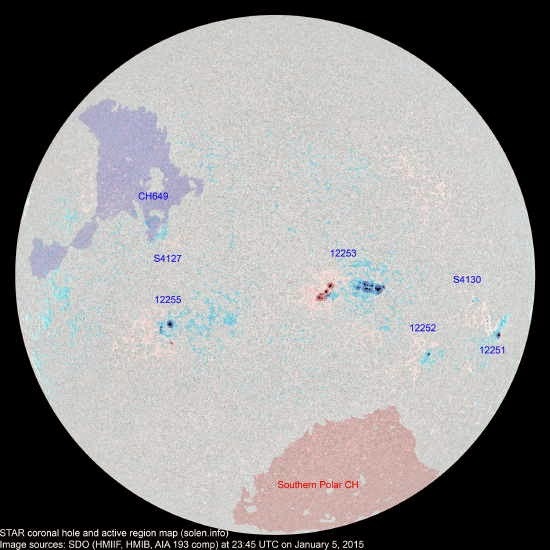 Some 'hot spots' are ENG, FRA, ITA and XOE. We last used these 'rules' for CLE174 in September 2013. There's been a lot of discussion lately on the Yahoo Groups ndblist regarding the "low-noise vertical" (LNV) and it's seemingly excellent performance. Originally described by Dallas Lankford as a good performer from LF to SW, ndblist member, Phil (KO6BB), recently refurbished his earlier built 'LNV', but this time with better feedline and appropriate ferrite cores for the antenna's matching transformers. Some of his description appears below. ... about 30 feet of antenna, set at roof-line level in this mobile home. As I wasn't sure how well the antenna would perform, I first made it a "Zero Dollar" project, using items I had on hand. Those items included two toroid cores salvaged from a defunct computer PS. 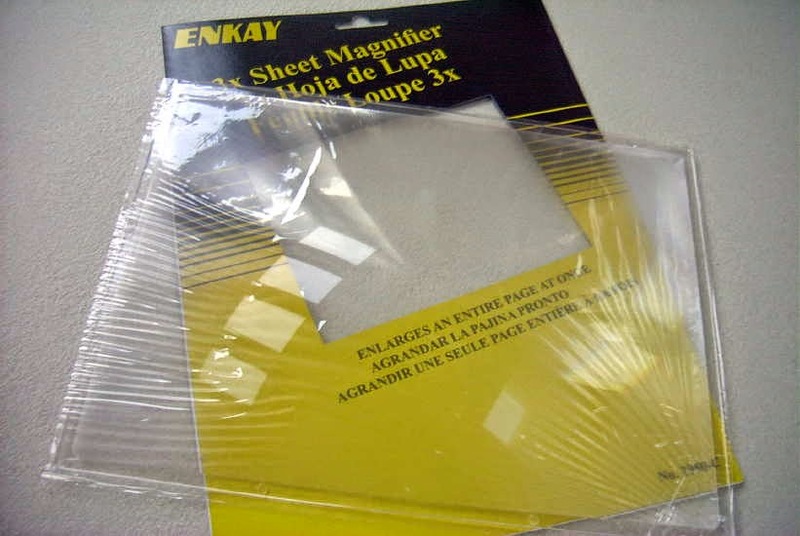 I figured that since the supplies operate in the kHz range (as witness what a dirty supply will do to your LF reception), they would be suitable for at least a trial run of the antenna. The balanced feedline was some CAT6 cable I had on hand. ratio is EVERYTHING in this hobby, NOT how high you can make the "S"
into the line and probably degrade it in rainy/foggy weather. two Amidon FT193-J toroid cores to complete the LNV the way I REALLY wanted to. probably not likely but why take a chance. weak NDB even 1 "S" unit is a LOT! I'm going to 'assume' 6dB per "S"
unit as I have calibrated the "S" meter of the R-71A receiver. NOTE: This is 'fuzzy' math, don't take them as 'exact' on the dB readings. across the board. So GOOD grounding on this antenna does make a difference! but then, antennas ARE the magic art. 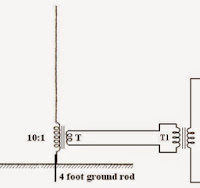 It appears that the grounding plays some importance in the performance of this "non-resonant" aperiodic antenna and the fact that it is non-resonant on the frequencies of interest likely also plays an important part in its good S/N performance. Several years ago I noticed something similar. My own 10' tuned air-core loop made an excellent receive antenna on 160m, even though the loop was tuned to around 300KHz! Although signal strength was several S-units below my transmitting antenna, the loop was extremely quiet and weak signals were much easier to copy ... In fact I often heard signals on the mis-tuned loop that I could not hear on my resonant half-sloper radiator. Another ndblist proponent of the low noise vertical is John, in Colorado, who employs three ... one of them a great-looking tilt-over version. The tilt-over is nicely demonstrated in his short you tube video below. The antennas are also used in combination via his Quantum Phaser, when DXing the broadcast band. The excellent phasing results can also be seen in his short video, while using a wonderful, like new, Hammarlund SP-600 JX. Dallas Lankford's original article may be found here, while an earlier more encompassing discussion will be found here. A third Lankford article, discussing 'Signal To Man Made Noise Ratios' and comparisons of various receiving antennas, also makes for interesting reading. 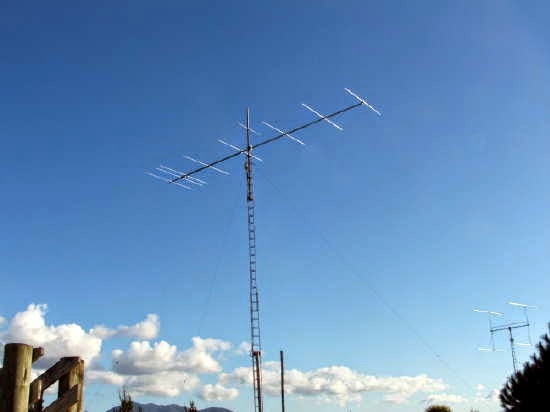 Perhaps the 'LNV' might be the antenna you're looking for to boost your LF/MW reception. only and with Spectran running for signal analysis. apex at about 40 m. The antenna outside shielded and center conductor were connected effectively making the antenna a vertical. There was no impedance matching. One ground radial about 300' long was laid out laying on the surface of the ground. The resonance circuit was tuned using a combination of a Blackberry Z10 smart phone real time video chat link of Spectran from the ham shack in combination with a portable VHF audio feed to both visually and audibly tune the resonance circuit for maximum output. I tried a parallel resonance circuit but it did not work. tinkering to transmit a signal on the 630 m band a distance of 60 km. Thanks for the first 630 m band contacts. It was fun. 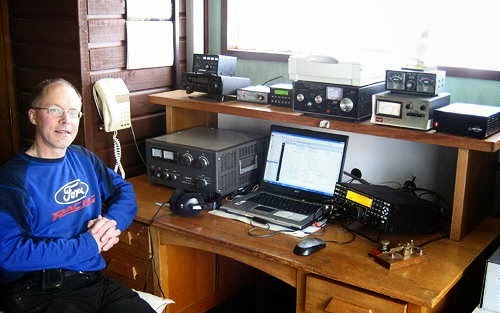 Now I'm going to start planning a permanent capability on 630 m."
Mark's setup reminds me of a Rube Goldberg machine but it all worked well enough for him to put out a solid 559 signal at 60km distance and provide his first official 630m contact. 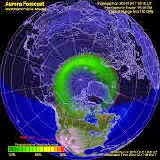 It would be great to see some activity from northern BC, VE6, VE5 and points further to the east. How about it fellas? I have recently received permission from Radio Amateurs of Canada (RAC), our national organization similar to the ARRL, to post a copy of an article that I wrote for their bimonthly journal, 'The Canadian Amateur'. I have posted a link to the article on my main web index page..."A West Coast Lightwave Project", which describes the building and operating adventure, shared with Markus, VE7CA. This link will also take you to the page. I like to follow the sun, but ... that doesn't mean that I pack-up and head to Hawaii every winter. I like to follow what is happening on the sun as it so profoundly affects every aspect of skywave propagation. 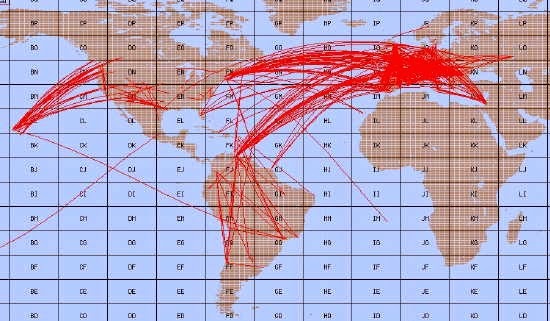 Where do you get your propagation information? If you're anything like the rest of us, you probably have two or three favorite sites that you visit to collect the latest data. The news of NOAA's new solar page has been making the e-mail rounds of late and just in case you've missed it....the "Space Weather Enthusiasts Dashboard" (and what ham isn't a 'space weather enthusiast'?) can be found here. The new site provides an all-in-one viewing experience, with up-to-the-minute reports on such things as the 'K' index, dynamic solar images from various satellites and at various wavelengths, auroral conditions, CME impact predictions (dynamic), a TEC (Total Electron Count) map, sunspot and Solar Cycle activity graphs and more. 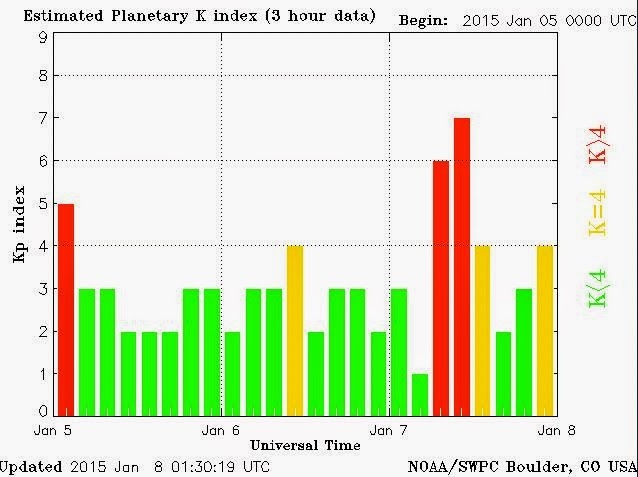 I didn't see anything showing the daily solar flux numbers (SFI) but it may be there. There is now a growing belief that the SFI value is not that great an indicator of what will or won't be happening, radio-wise, especially when it comes to 50MHz. My favorite site is still SolarHam, manned by Kevin (VE3EN). It also provides a smorgasbord of solar information, even more than the new NOAA site! If you haven't checked these three sites out, have a look...they're well worth a bookmark and a daily visit ... and, you won't have to go to Hawaii to follow the sun. A New 'VE' on 630m! 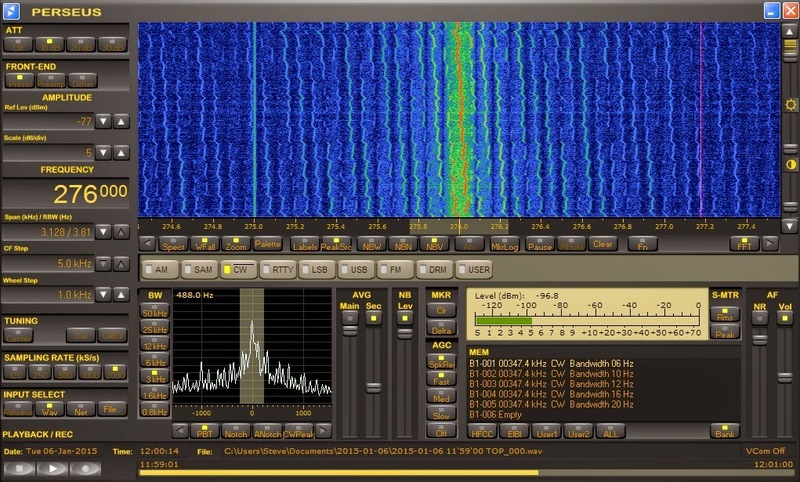 Interest in Canada's newest ham band, 630m, continues to slowly grow. 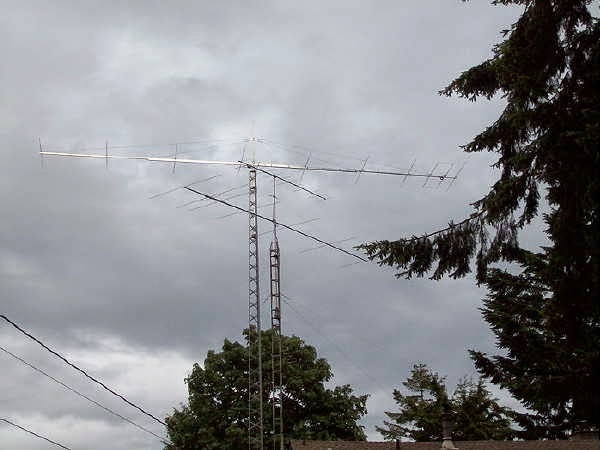 Toby (VE7CNF) in Burnaby, BC, has made his first and second CW contacts on the new band! 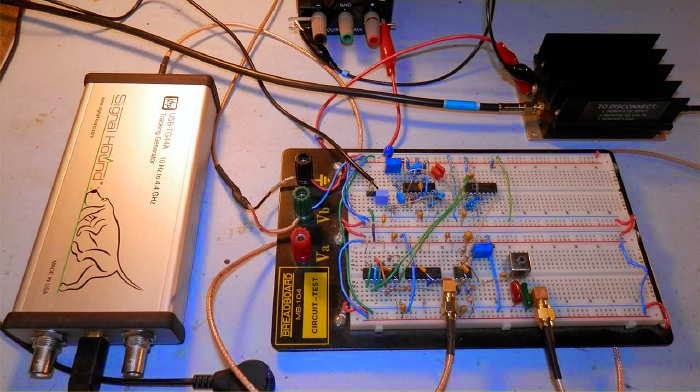 "I have put together a low-power 630m WSPR transmitter here. I have a USB-TG44A signal generator clocking a phasing-type SSB modulator with WSPR audio coming from a laptop. The modulator gives 45db suppression of the carrier and lower sideband. 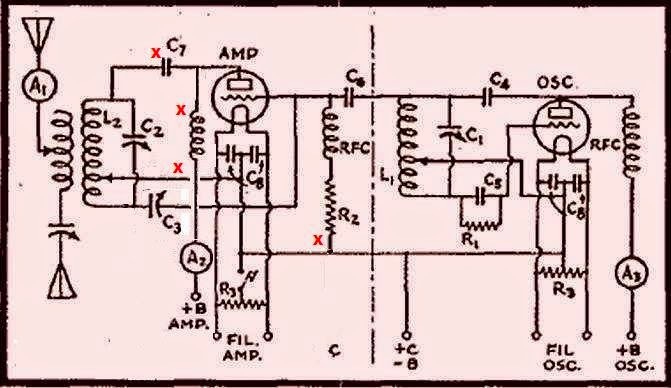 This drives a ZHL-32A 1-watt linear amplifier. 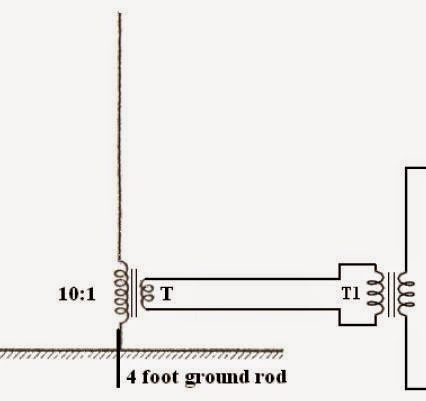 I have a matching transformer and loading coil at the base of my 80-meter inverted-L antenna. Wire height is 10m. John VE7BDQ has weakly received my WSPR signal. Are you able to receive WSPR? The antenna series resistance is much higher than I expected, probably due to 10 year old antenna wire and only 4 ground radials. Right now the antenna match is poor and efficiency is very low. I may rewind the matching transformer tomorrow and gain a few dB. Maybe soon I’ll have enough signal to complete a 2-way CW QSO with you. I have attached pictures of the hardware. 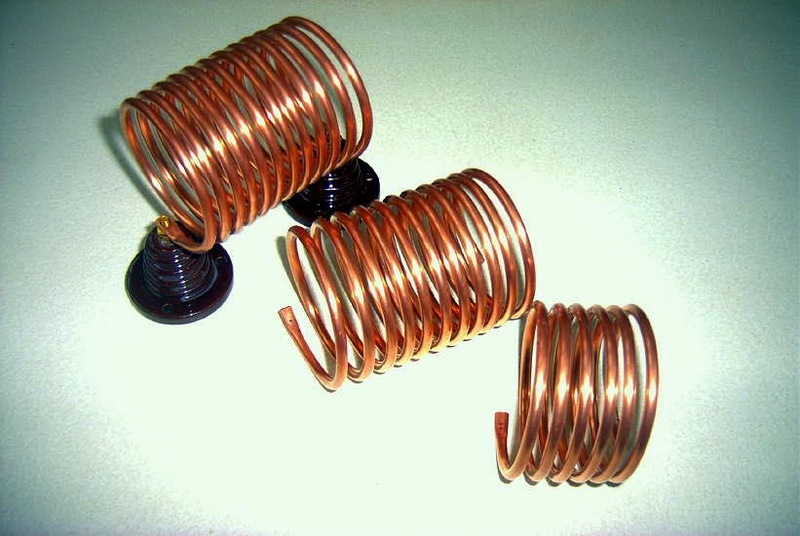 After I determine the proper configuration I’ll make a more efficient loading coil." Toby has indicated that he will soon start construction of a dedicated DDS-based transmitter, with more power to work with. 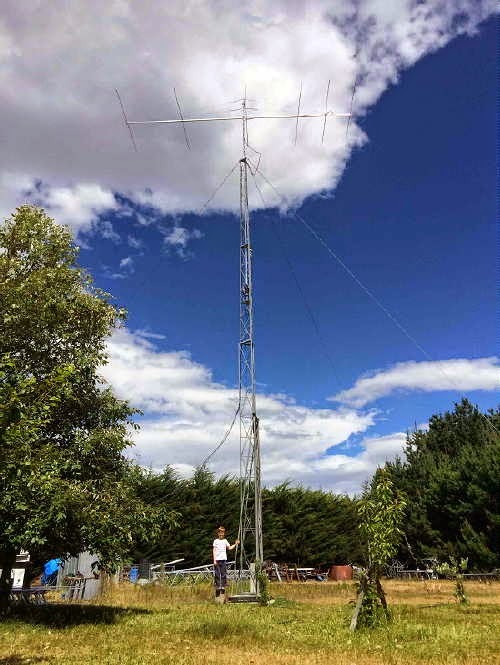 Situated on a normal-sized suburban lot, and base-loading his 80m inverted-L, is proof once again that fancy antennas and a few acres are not needed to have fun on 630m. Toby's initial night WSPR tests were copied by WH2XGP (W7IUV), near Quincy, Washington, at a little over 200 miles (325km) and on the other side of the rugged Cascade Mountains! Here is a short video of VE7CNF beaconing in QRSS mode before our QSO. The distance between us is approximately 53km (33 miles)...not bad for 1 watt! It's great to see new activity. 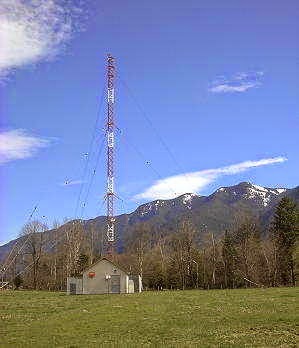 Both VE7PJR (Chuck, near Kamloops) and VE7CA (Markus in North Vancouver) are constructing rigs for the band at present. As well, VE6TA and VA5LF have expressed interest and both have completed crossband QSO's with me on 630m. As I mentioned to Toby, I'm starting to believe that 630m is a very forgiving band when it comes to both skywave and groundwave as signals have always been much better than I had originally expected. Moving down from 2200m has been the difference between night and day as there is so much more potential for real-time communications on this band compared with 2200m. In response to an earlier blog about my recent neighbourhood noise problem, Matt (W1MST) , has passed along an interesting link to one ham's solution to a grow-op light source noise. Although I don't necessarily advise taking the same approach, W0IVJ's unique engineering skills may also provide an answer to some other amateur's noise problem, be it any type of ballasted noise-emitter. The rest of his website is well worth a close look as well. 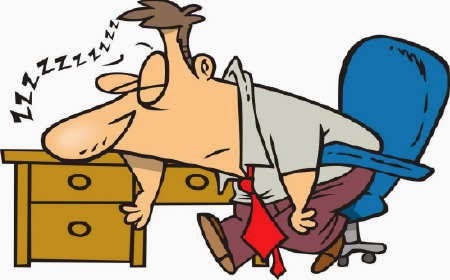 Another type of noise problem was addressed in a posting to the topband reflector today by Don, WD8DSB.....the noise coming from a treadmill's, PWM speed-controlled DC motor. the K9YC hams guide to RFI document). see the effectiveness of the filters. " These two amateurs have developed slick solutions to their noise problems, but sadly, noise ingression is rising exponentially it seems and is becoming more and more challenging to mediate. With the Bz component of the Interplanetary Magnetic Field turning southwards yesterday, an unexpected incoming stream from the sun was able to interact more intensely with the earth's magentic field , producing some fairly active auroral conditions overnight. The 'K' index numbers rose as high as '7'...a rare event, indicating a major disturbance. By dawn, much of the activity was winding down and the ensuing F2 MUF spike was not far behind. I hope that you were one of the alert 6m operators (not me sadly) able to take advantage of the quick F2 lift. Several stations on the east coast were worked or heard in Europe (EA8, EA7, EA3, IK5, CT1, G3, EI4) while in the afternoon, lucky band-watchers found several loud KH6's to work. The 6m prop map reveals the unexpected level of mid-winter activity....as of Wednesday evening, the Bz is still pointing south and the K has risen to level 4. Those of you following the CLE low frequency NDB listening events, will know that this past one was longer than usual, running from December 25th to January 6th. Once again, the sun demonstrated its nasty-side, right on schedule. Conditions from this part of the continent were dreadful, while others, further to the south, were not as badly affected. The cause of the poor propagation was a continual coronal hole stream, from a very large area in the sun's southern regions, as shown here. Now it appears that Coronal Hole 649, in the north, is about to swing into a geoeffective position, and take over the task of disrupting propagation. CLE189 covered the range of 275-425KHz, with the objective of logging at least one beacon (preferrably the farthest one) on each available channel (150 in total). There are a number of channels that have no NDBs as well as many that get completely clobbered by 1 Kw DGPS (digital QRM) navigation signals along the coasts and the Great Lakes. Additionaly, I was fighting the new noisemaker in my neighborhood, which has yet to be eliminated. Here is a screen shot of my Perseus receiver, showing the crud being generated...every 60Hz and never constant...drifting in and out of the desired passband continually. The only way to hear signals was to wait until there was a short hole created by the drifters going by. I will be happy when this is issue is finally resolved. Once again, the 10' x 20' loop was employed for the entire affair, surviving two bad wind storms during the listening event. It seems that if I'm not chasing down noisy power poles or hunting for drifting wireless headsets, both of which have tried their best to tax my 6m reception this past year, I spend several hours each year chasing down delinquent noise generators! I spent yesterday afternoon searching the neighbourhood for the source of an annoying and disruptive 120Hz hum. Testing my patience for about a week now, the AC buzz has been ripping-into my usually quiet LF reception, disrupting efforts to participate in the latest CLE (189) listening event. Although conditions have been poor, as usually occurs during these events, the signal-shrouding AC hum has made the event a real struggle. I had been hoping that, whatever the source of the suddenly-appearing interference was, it would disappear as quickly as it had arrived. I had first noticed it several weeks ago, but it would always go off around bedtime and often was not there at all in the evenings...but the past week it has been there 24/7. 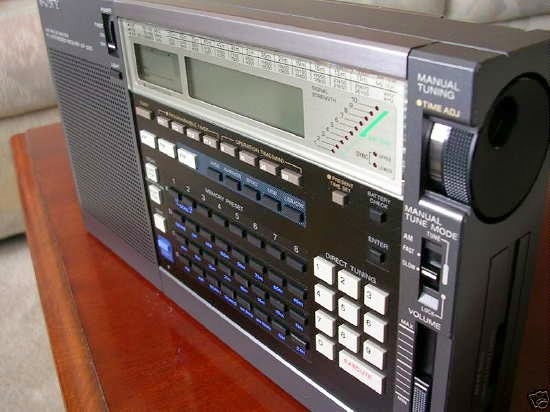 Yesterday I had finally had enough and with Sony 2010 in hand, along with its built-in ferrite bar antenna, I tuned the radio to 630m and started walking around the neighbourhood. The first thing I noticed was that the signal was being propagated along the overhead powerlines and it was difficult to get a direction of the true source...all nulls pointed to the closest line. Walking to the north, the signal gradually became weaker and reversing direction to the south produced an ever-increasing AC hum...progress! I eventually found a corner where the QRN peaked, and walking in all directions from that point saw the noise diminish...getting warmer! There were four possible homes here that could be the cause of the problem. I spoke with three of the four homeowners, all of whom seemed genuinely concerned about the source. They all let me into their homes and, with radio in hand, look for the source of the (by now) loud buzz. None of the three homes seemed to furnish the nasty noisemaker. House number four was unoccupied but was, I was told, up until about a week ago. Venturing on to the property, the S9 buzz started to climb and by the time I had reached the porch, the Sony was on the verge of self-implosion...getting very hot now! 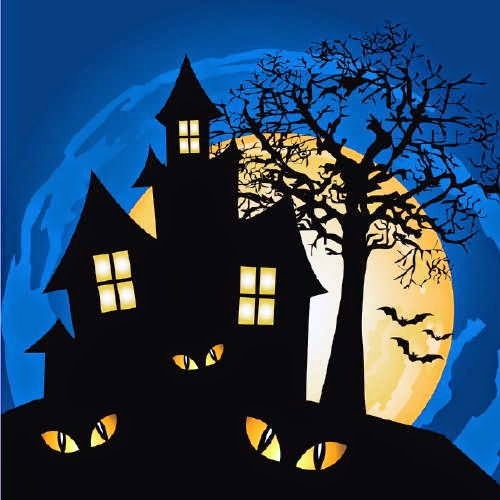 A knock on the door confirmed that nobody was home but...behind the curtain, there it was...a floor lamp was turned ON!! With the source now located I could now breath a little easier but unfortunately could not hear any quieter. Hopefully the owners, who go back and forth to the mainland frequently, will return soon and that LF will once again sound as it should. What could be screwed into that floor lamp? 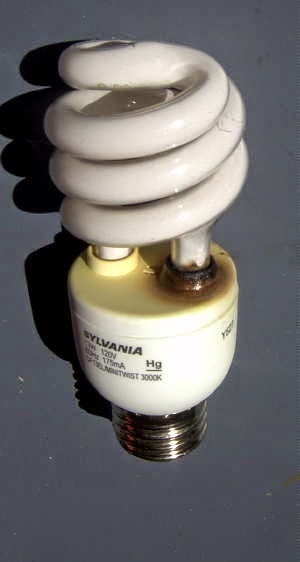 I'm betting on a poor-quality or about-to-fail CFL bulb. The one on the left is the actual bulb that I removed from a crawlspace, about four years ago, three houses away. It had been creating the same sort of buzz, only louder, as it was much closer. It was not emitting any light whatsoever yet continued to generate noise as well as present a real fire hazard. The house occupants had left it switched 'on' in order to discourage the local otter population from making a winter home in their crawlspace. Somewhere along the line the bulb had failed and started generating large amounts of AC hum. This one was tough to find, as even several blocks away, it was very loud. It seems that power lines make wonderful LF antennas. I had to make a map showing signal strengths at many locations to find the source... my neighbours have since given me a key to their house, just in case it happens again! So...what do you think is in house number four? When the winter solar flux numbers drop to dismal levels, many 6m guys just stop watching the band...myself included. During the last solar rotation, flux values rose to near-Cycle highs and quickly plummeted, along with any hope of finding that six-meter Holy Grail...long-haul F2 propagation. Many six meter ops quickly found other things to do. One person that didn't stop watching, and never does, was John - VE7DAY, in Campbell River, B.C., on Vancouver Island. John is VE7's iron man of 6m and spends almost 100% of his radio time seeking the magic. For the past few winters, John has pointed his beam towards the south Pacific at around sunset, and called CQ from the VE7 black hole....on Tuesday evening he was justly rewarded. 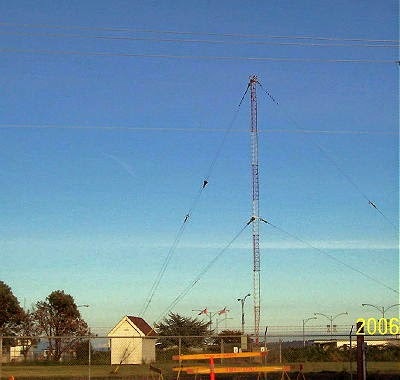 At 00:50 UTC on the 31st, John's CQ was answered by Roger, ZL3RC in Christchurch, on New Zealand's South Island...12,021km from Campbell River. One minute later, John worked Chris, ZL2DX, in Martinborough, on the North Island. At 0111 UTC, John completed the hat-trick by working Paul, ZL4PW, in Oamaru, back on the South Island. 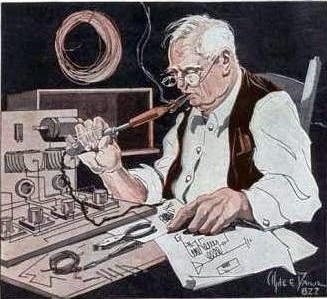 "Decades ago, many DXers believed that Argentina was the world DX hot spot. DXers and contesters seemed to do the best down there. When I was in Brazil, one of the places I lived in was the state of Mato Grosso do Sul, PT9-land. It was only about an hour-and-a-half's drive to the Paraguay border, so conditions there were pretty near like those in Argentina, which was also nearby. I ran 100 watts to a vertical wire taped to a bamboo rod... and thought my QTH must have been included in the hot spot area. I think now we are becoming aware of another hot spot, this one being in North America on Vancouver Island. I'm speaking, of course, of the your QTH, John! You seem to be doing quite well from that location. Keep it up!! I see you worked clear down to ZL4. I'm envious. I've been looking for a ZL4 contact for a long time. Today when the band was open to ZL, I was on the road returning from Tacoma. Well, I'm glad you were able to work that great DX. I will change the Distance Scoreboard to indicate the new records you established today. Congrats! With the present dismal solar flux and low solar activity, it is not likely that these contacts were via the F2 mode, but you wouldn't know it from the size of John's signal, recorded by ZL3RC. Being in the middle of our secondary sporadic-E season, north of the equator and at the peak of the major Es season down-under, I think a better candidate is an Es-link from both sides into the Trans Equatorial afternoon 'bubble'....certainly Es from both ends into whatever is happening in the ionospheric cauldron at the equator! All four stations were running high power and big antennas, and with a little help from the seasonal E, it all seems to have come together nicely. Congrats to all involved, and especially John, as all of the other 6m ops in this part of the country, including myself, were asleep at the switch it seems!